One of the ten switchbacks on The Wall, High Voltage Trail. Riding across the dam at Raccoon Mountain at the end of a day's ride. One of the only flat sections on Live Wire. A small step-down on Split Rock. Rolling boulders in the Chunky freeride area. Through the powerlines at the top of Live Wire. The upper portion of High Voltage briefly hugs this cliffline. Following the trail through sandstone outcrops on Split Rock. 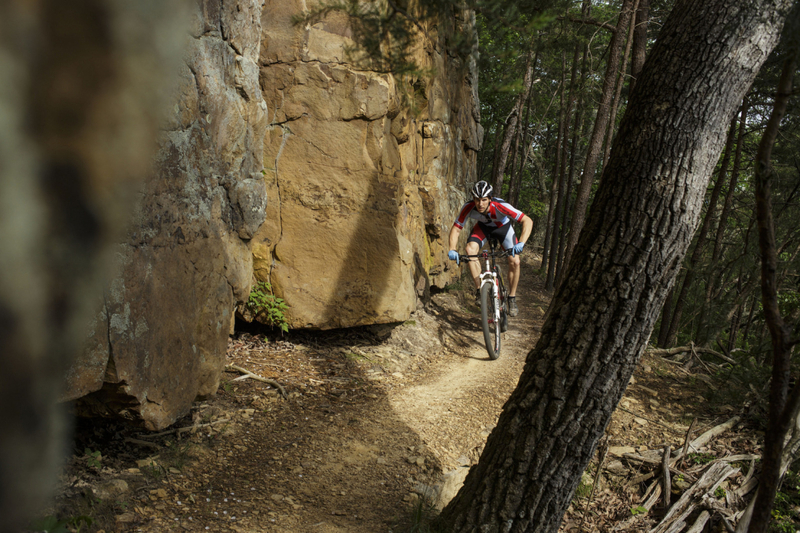 The area features more than 30 miles of intermediate to advanced singletrack. 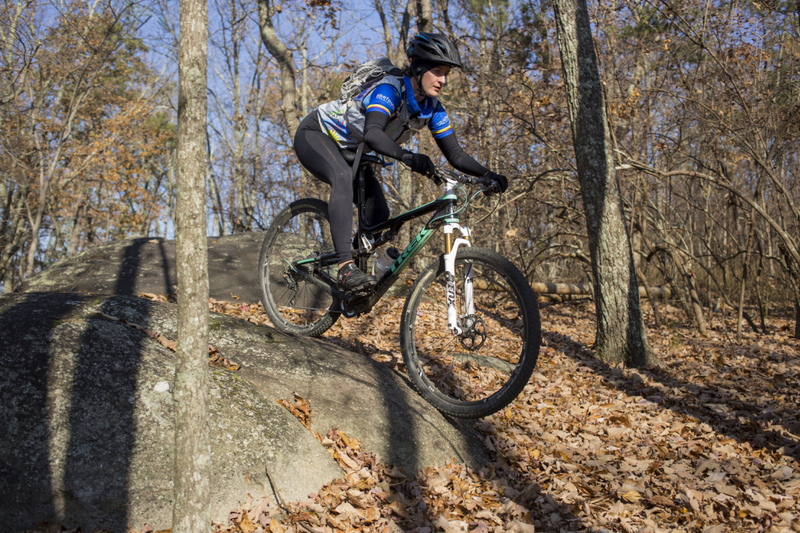 The TVA Raccoon Mountain trails are the result of a groundbreaking partnership between Chattanooga’s IMBA-SORBA chapter and the Tennessee Valley Authority. 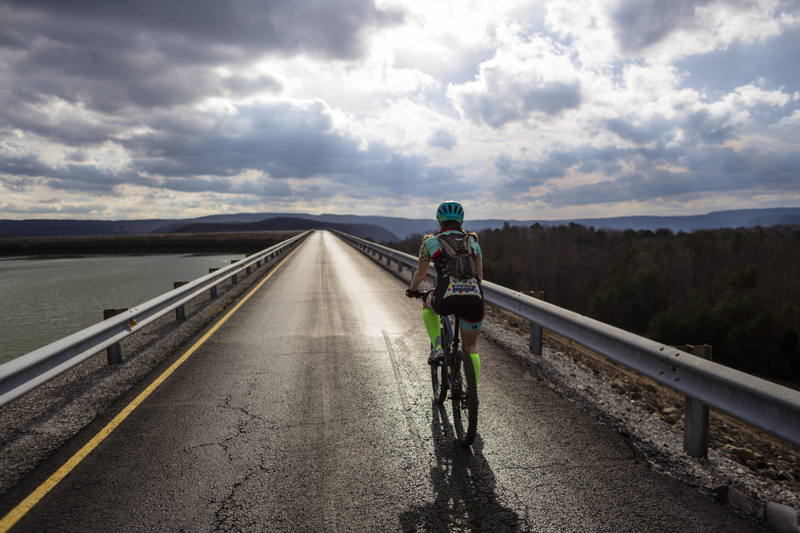 This well-planned, sustainable trail system is built around the reservoir for TVA’s pumped-storage plant, turning previously-underused mountain terrain into a popular recreation area and a mountain biking mecca. 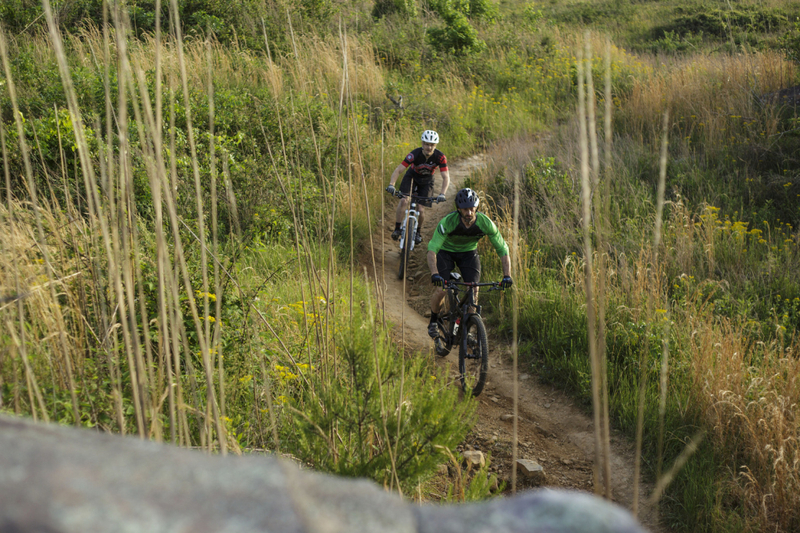 Oh, and it's one of the best places for mountain biking in Chattanooga. While none of the trails at Raccoon are directional, it’s hardly needed; even with the parking lots full, the trail system is so extensive that it never feels crowded. Be sure to check out the view of Chattanooga from the East Overlook parking area, as well as a couple of beautiful glimpses into the Tennessee River Gorge along the perimeter of the trail system. My favorite is at the end of a short trail spur near the eastern end of the Small Intestine! East Rim, Electric Avenue 1 and the Small Intestine dole out big helpings of fast, flowy singletrack, while a ripping descent down Live Wire 1 or Grindstone Ridge (CW) will put a smile on any rider’s face. If you love rocks and technical obstacles, don’t miss Megawatt, Laurel Point or Live Wire 2. See the map for trail descriptions, and see below for some recommended routes. 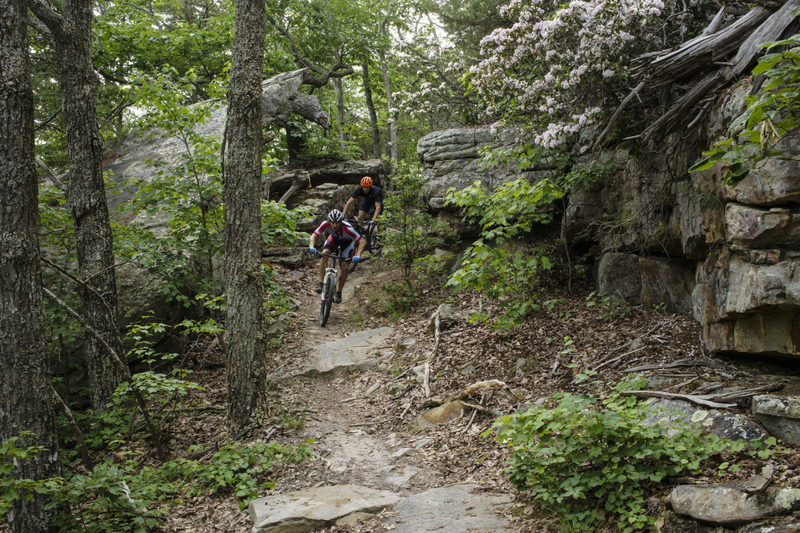 The classic ride on Raccoon Mountain is a full outer loop, either clockwise or counter-clockwise. Which is more fun is hotly debated... try both! This loop should be about 13 miles without the Small Intestine, or 16 miles if you choose to include it. To ride the 13-16 mile classic loop, CCW: start at the Laurel Point parking area and enter the trail near the kiosk. Take a left and follow signs to ride Laurel Point, Electric Avenue 1 and East Rim. When you come out onto a gravel road, ride downhill for 0.2 miles or so and take a right at the trail sign for Connector. Follow this trail over to the Small Intestine junction, where you will have the option to either add the Intestine to your route or skip it and head up Grindstone Ridge. From there, Megawatt and River Gorge will take you back to the car. Reverse these directions to try it clockwise. Grindstone is the toughest climb of the day, and the Megawatt trail that immediately follows it is the most technical; you may choose to skip Megawatt by taking a trail spur to the left, turning right on the road and riding across the dam. Conversely, expert riders looking to spice up this loop further may choose to swap in Lower Chunky for the connector trail, or spend some time sessioning the different lines in the Chunky Freeride Area. Want something brand new? The recently-opened trails on Raccoon, High Voltage and Live Wire phase 1 and 2, are some of the steepest and most challenging in the area. 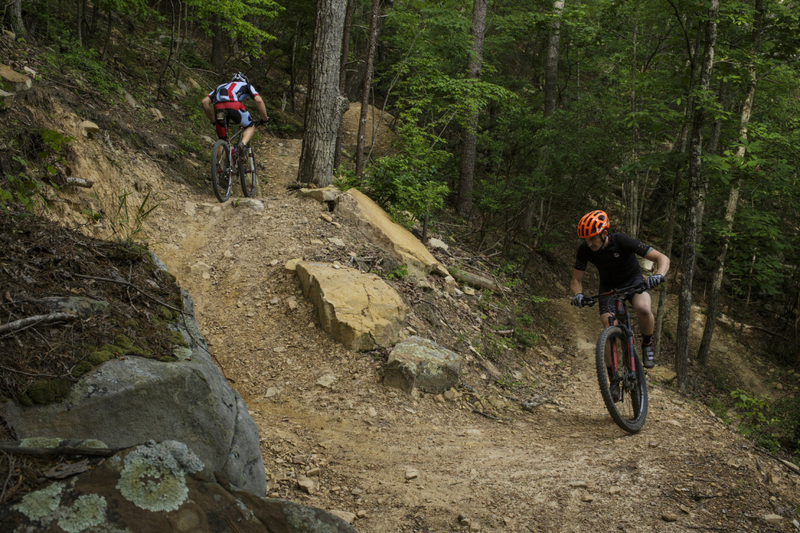 The upper half-mile of High Voltage must be seen to be believed, with 10 switchbacks carved precipitously into the edge of the mountain, and Live Wire phase 2 is a rocky, technical romp that feels more like western North Carolina than eastern Tennessee. To ride the 13-14 mile new loop, CCW: I recommend counterclockwise, which starts with a blistering descent down the mostly-smooth track of Live Wire 1 followed by a chunky downhill through the spectacular Live Wire 2. For this route, the new trails replace the Switchyard Grindstone Megawatt River Gorge portion of the classic loop. Park at Laurel Point and follow the directions above until you reach the end of East Rim. Here, take an immediate right instead of proceeding down the gravel road, and hang on tight for a 5-mile downhill through Live Wire 1 and Live Wire 2 that loses more than 1100 feet of elevation. When you reach the bottom, get your lungs and legs ready for the climb of your life, as you’re about to gain 800 of it back in High Voltage! Can you ride all 10 switchbacks at the top? When you reach the signpost and join up with Split Rock, stay left, then take a left onto Laurel Point in order to return to the parking area. If you’re looking for a 30 mile epic with lots of climbing: Combining the CCW “new loop” above with a CW “classic loop” touches nearly every trail on the mountain. Simply take a left when you hit Split Rock, another left on Laurel Point and continue around the mountain from there. The fastest riders will be able to complete this route in under 3.5 hours, but most mortals can expect a 4-6 hour epic. 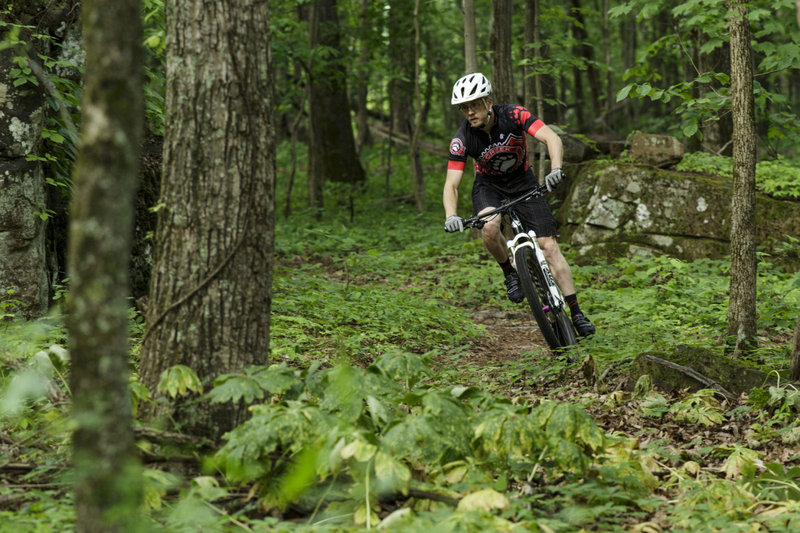 Those new to mountain biking can still ride the counter-clockwise loop around the mountain, but will likely need to skip both Laurel Point and Megawatt. Luckily, Electric Avenue 2 affords a bypass. To ride an easier version of the classic loop CCW: Starting from Laurel Point, ride clockwise on River Gorge to access Electric Avenue 2, then take a right. This trail parallels Laurel Point road and bypasses the Laurel Point trail; at the end, take a left on the pavement, go through the yellow gate on your right and re-enter the trail system onto Electric Avenue 2. When you’ve completed Grindstone Ridge, take the trail exit to your left to exit onto the pavement and take a right; ride across the dam, take a right onto Laurel Point Road and hop back onto Electric Ave 2; at the unsigned four-way junction, you may either take a right to access the start of River Gorge or simply continue straight to repeat the last section of Electric. 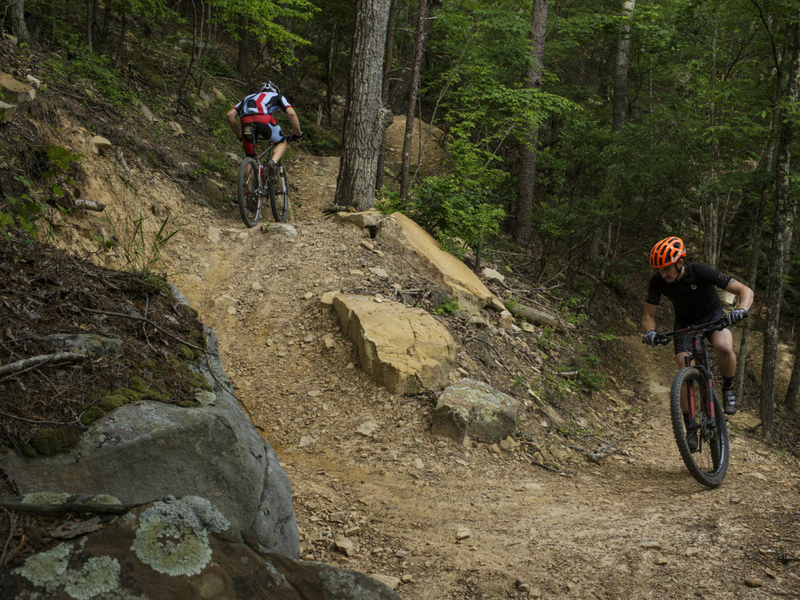 If you ride mountain bikes in the southeastern United States, you’ve probably heard of Raccoon Mountain. If you’re simply visiting the area and looking for a legit ride while you’re in town, this is the place to start. 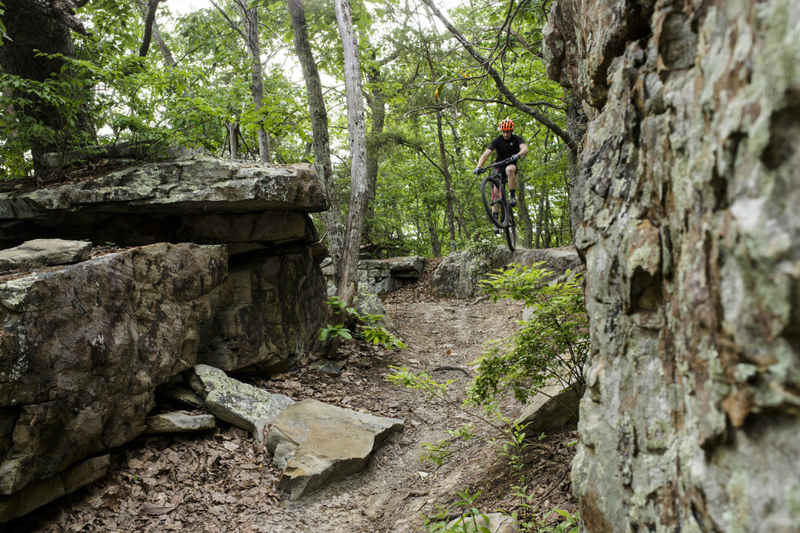 While beginners and flow junkies might be better served at Enterprise South or Five Points, Raccoon is “real” mountain biking, a network narrow singletrack that snakes through the forest high above Chattanooga. Expect roots, rocks, steep pitches, more rocks, close encounters with trailside trees and as much fun as you can handle. There are three trail-access parking areas on top of the mountain (East Overlook, Switchyard and Laurel Point) and two more at the bottom (Massengale Point, Boat Ramp). While many locals use the East Overlook parking in order to hit the trails quickly after work on weeknights, the best facilities are at Laurel Point which features a bike wash, repair stand, changing rooms, water fountain, flush toilets and an under-construction (as of summer 2014) pump track. Laurel Point is the only place on the mountain with water, so if you need to refill your bottle or hydration pack mid-ride you’ll need to plan accordingly. Parking at the boat ramp guarantees a brutal climb to start your day, and an excellent downhill to end it, no matter which direction you ride. Please DO NOT park at the Visitor’s Center; TVA would like this parking lot to remain free for visitors, and has invested heavily in improving the Laurel Point parking area specifically for this purpose. Trails are open sunrise to sunset, year-round, but SORBA-Chattanooga may close the trails in the event of heavy rain or freeze-thaw conditions. Be respectful of the trail system, the volunteers who maintain it and the land manager - do not ride if the trail surface is soft, or if your tires are leaving a rut!